Hello, party people! 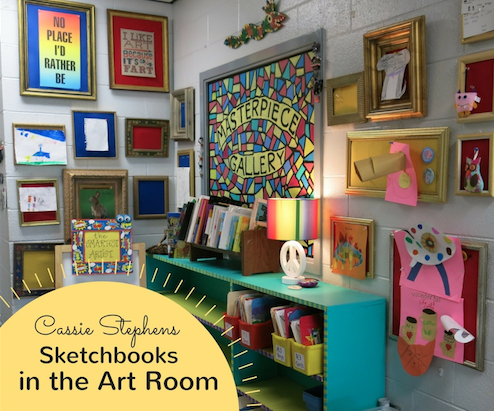 I'm excited to share with y'all today some things that are goin' down in the art room...namely, just how my students are using their sketchbooks! I see my third and fourth grade students for an hour (my other classes are 30 minutes in length). For that reason, I decided to introduce them to sketchbooks this year. We created our own sketchbook covers on the very first day of art and had a big time doing so. * On sketchbook days, my students will watch two 1-minute videos. The first one will be a Hot Minute of History (which I've shared here before) and the other will be a sketchbook prompt based on that history. Here's our first installment! 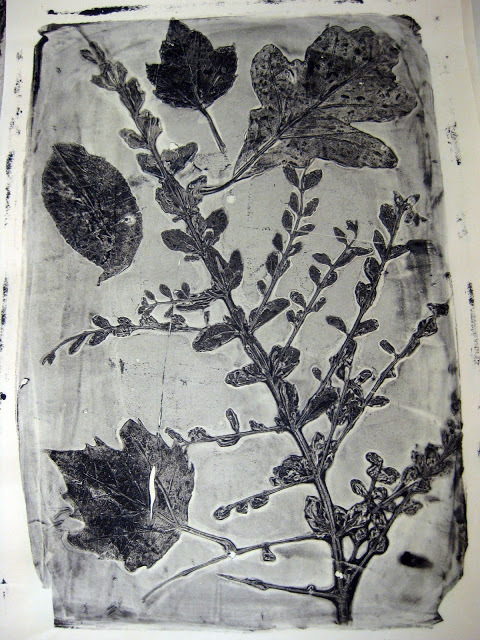 We used texture plates and fabric for the rubbing. I did end up swapping out the vine charcoal for black oil pastels as the charcoal did not work very well on the oil pastels. I had one student say they had "messed up" and that they wanted to start again on another sheet. I said, "If you were a cave artist, you wouldn't ask for another cave wall...you would make that drawing work!" And they did. It was a fun lesson on beautiful oops'ing! One of the main reasons I thought it would be good to sketch through Art History is that it is one area that I often fail to teach. There are SO MANY THINGS TO TEACH IN ART that I find I have to squeeze in as much as I can. This is one way I hope to do that. I introduced A Hot Minute of Art History before (more details here) but then it was just me chatting...and I tend to be long winded. Not only that but it didn't really resonate with the kids as they didn't have a creating-connection. So, hopefully, this will help. I am showing the one minute videos to my first through second grade students...they just don't do the sketching portion. We still get up and sing the song...but now we do it with a before video and a sketching intro! I was so excited by the sketchbook drawings and I know the kids were too. I can't wait to share our next Art History video with them! I also loved the variety of drawings. 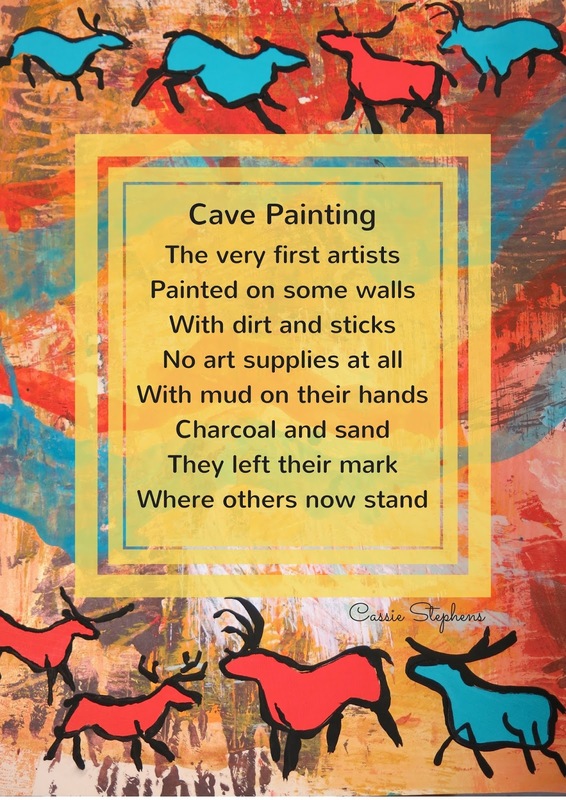 I did do a quick google search of cave paintings and placed a couple of simple sheets on each table for inspiration. My students are used to these Idea Sheets, as we call them. I know that I work best when I have some inspiration so I always provide that for my students. 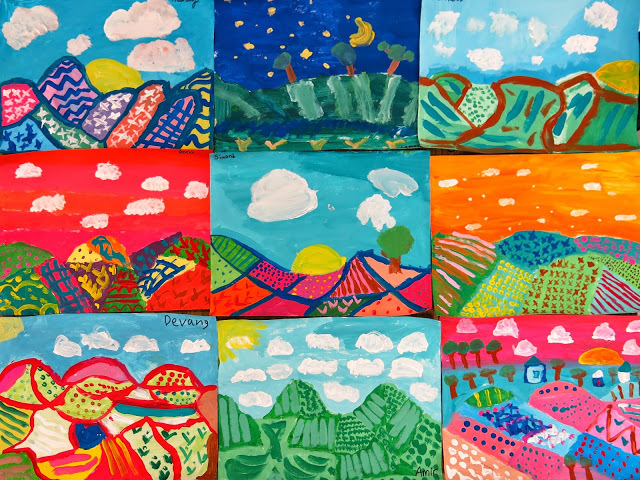 These paintings will later become posters to hold the lyrics of our Rockin' Art History song! 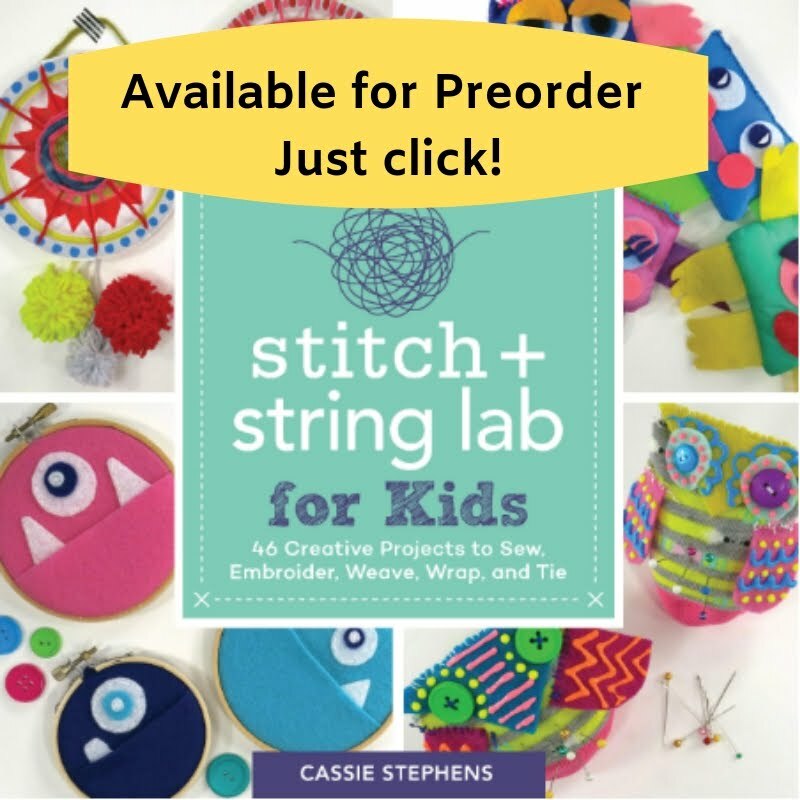 You can find the pdf for this here if you are interested! Feel free to use in your art room. All I ask is that you share your source when other's ask. 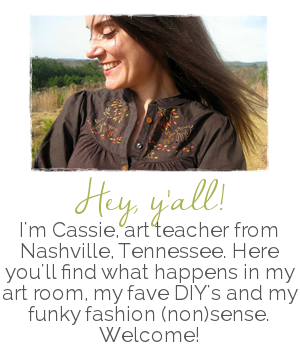 I would rather not post what I share to TPT...I would like to continue sharing. However, it is sometimes sad to see folks not give credit where it is due...especially when they got the information for free. So I ask politely and say thank you! Getting back into sketchbooks with the kids meant finding a place to store them. 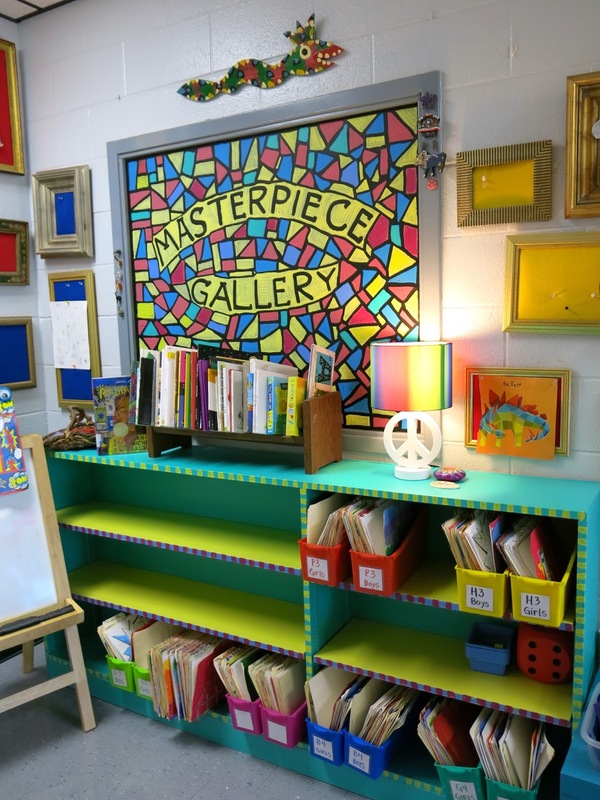 Earlier this year, I found this great bookcase that was in an abandoned classroom. After a little bit of paint, I was happy with the result. My bins from Target are the perfect fit! It really helps to have the folders divided by class and gender as that makes passing the sketchbooks our much faster and easier. I'll be sure to share our sketchbook adventures as they continue! Until then, have a super week! Happy fall, y'all! 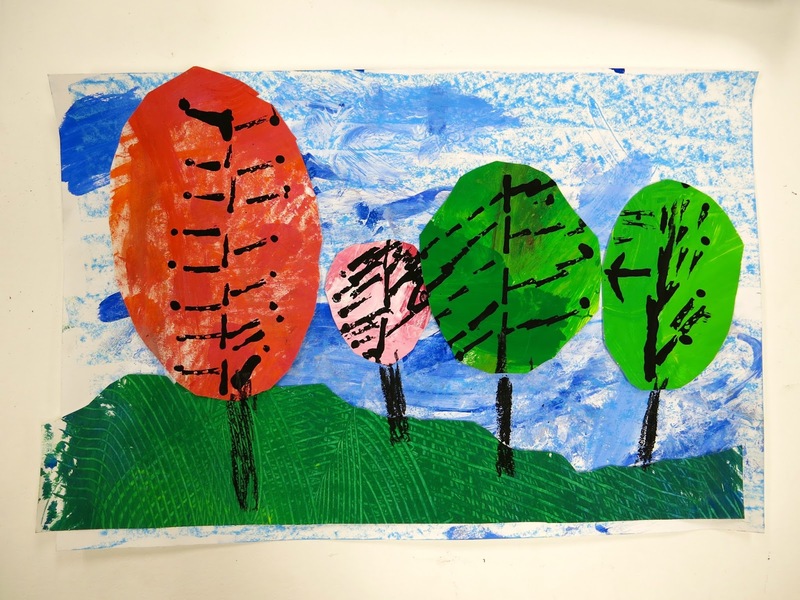 Last week I shared with you MY favorite fall crafts...today I thought I'd share my Top Ten Fave Fall Projects for kids! Let's kick it off with this weaving project because it's one of my very faves. 1. Tree Weaving Lesson I usually do this lesson with my students in third grade and up. I developed this lesson after being tired of the same old weaving projects I'd done for years. This video was created for you, as an instructor...but you could totally use it with the kiddos! You can see more of this lesson in my first blog post right here. My other first grade classes are wrapping these up this week. I am looking forward to seeing what they create! 3. Positive and Negative Gelli Prints When I initially did this project, I made my own gelli-plates. You can find the recipe here. What I don't love about making these plates is that, well, you have to make them and it's labor-intensive. Not only that, but if you are a vegetarian or a vegan, you will definitely be opposed to using the gelatin that goes into the making of these plates. 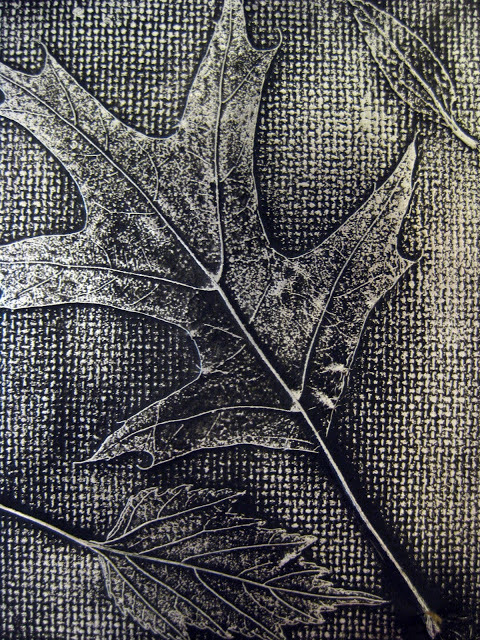 The good news is that if you own GelliArts printing plates, you can get the very same effect. And it's so much fun! 4. 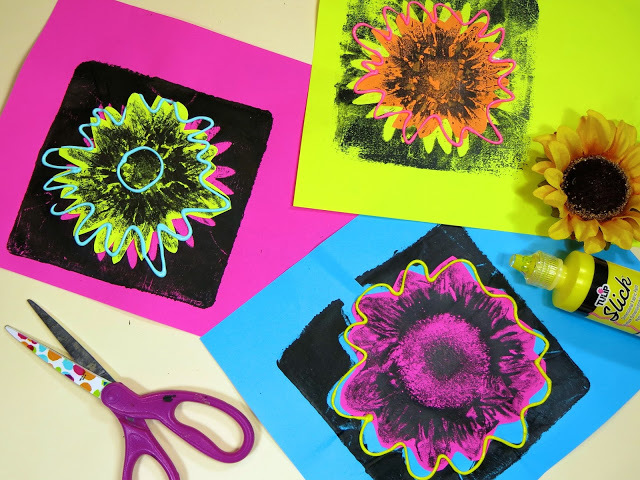 Sunflower Gelli Plates Prints with Puffy Paint Nothing says fall to me like Sunflowers. 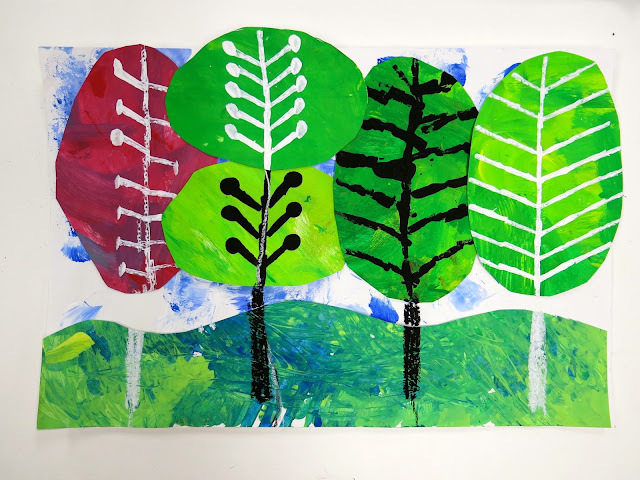 I loved this Andy Warhol inspired project and so did my second grade kiddos...although I think it could have easily been down with my older students as well. When we displayed these in a square kind of Warhol-style. 5. 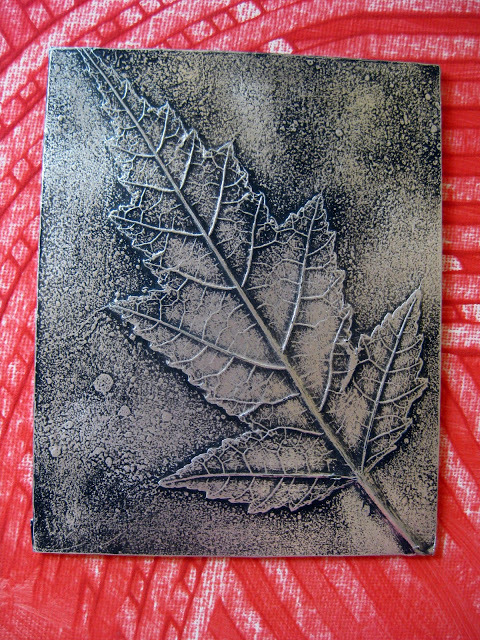 Leaf Relief Another great fall project that introduces kids to texture is this leaf relief project. 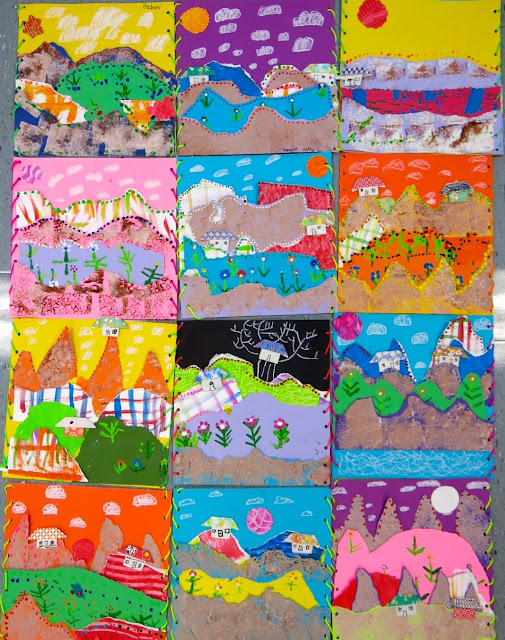 This is a project that I've done successfully with kids of a variety of ages from second grade on up! It looks really fabulous with a painted and textured canvas background! 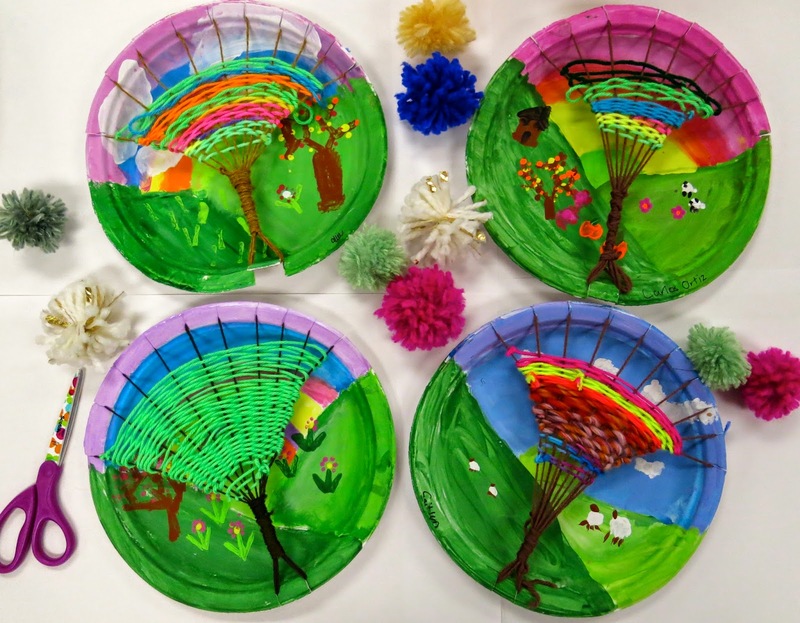 These were a crowd pleaser and really introduced the kiddos to so stinkin' much that's important to art makin'. 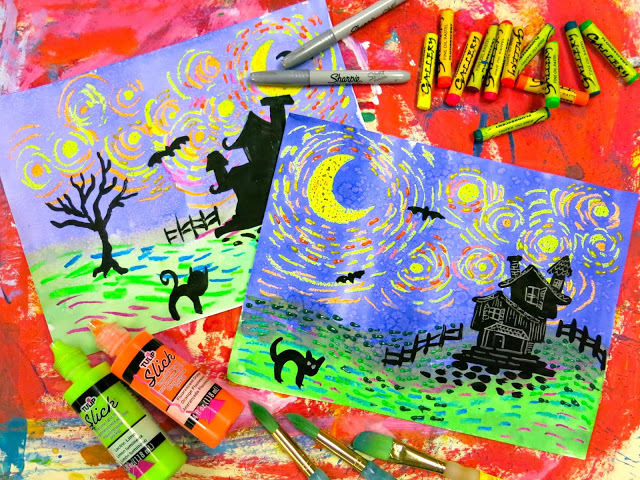 The kids had the best time creating these Spooky Starry Nights! 9. 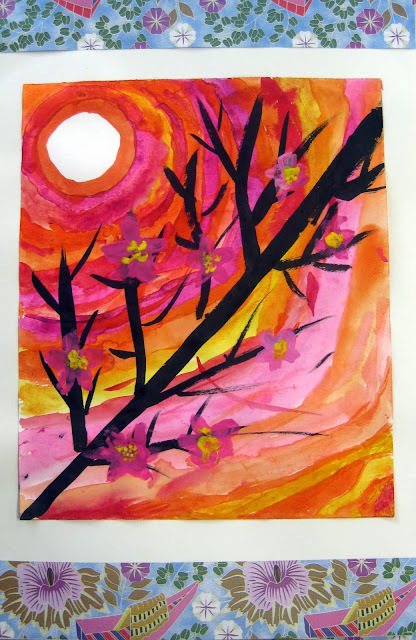 Fall Trees with Warm and Cool Skies So this project was actually done during a study of Asian art...but could so easily translate to fall! You can check out more of these beauties here. 10. 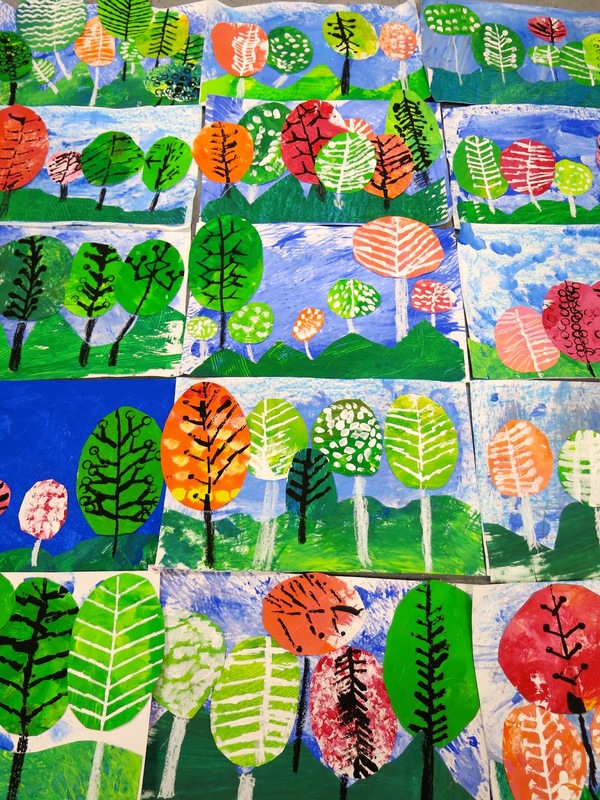 Collage Landscapes of Fall My sweet second graders are getting ready to embark on this project next week. I've not done this one in a couple of years and I'm ready to bring it back...they are so beautiful! This time around, I'll be creating a video so you can stay tuned for that...or just check the blog post here. Wow! I'm so excited for all, these pretties have me inspired! 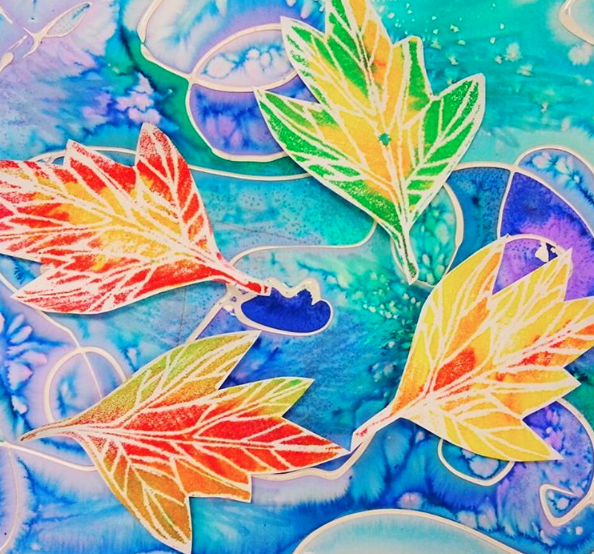 What are your fave fall projects? LOVE to hear about them. 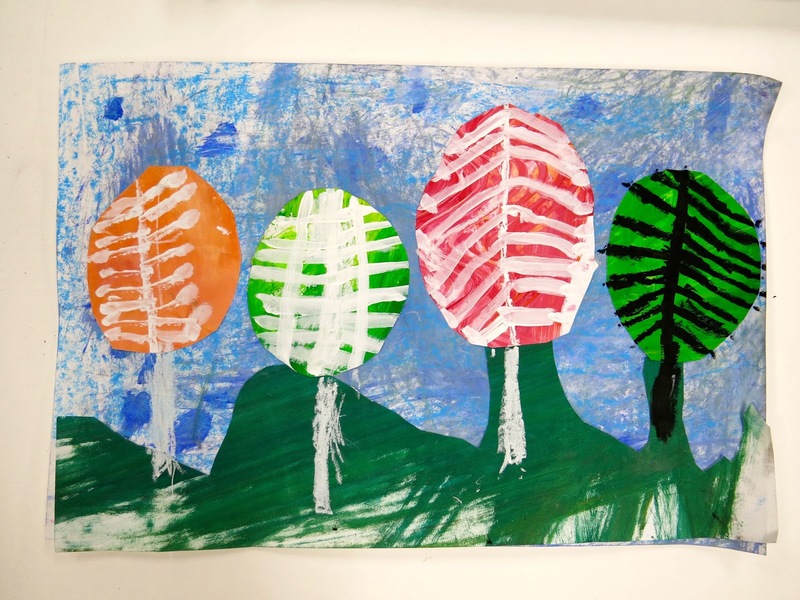 My first grade artists finished off these fall landscape collages inspired by the artist Eloise Renouf...and the artists (along with this art teacher) couldn't be more proud. 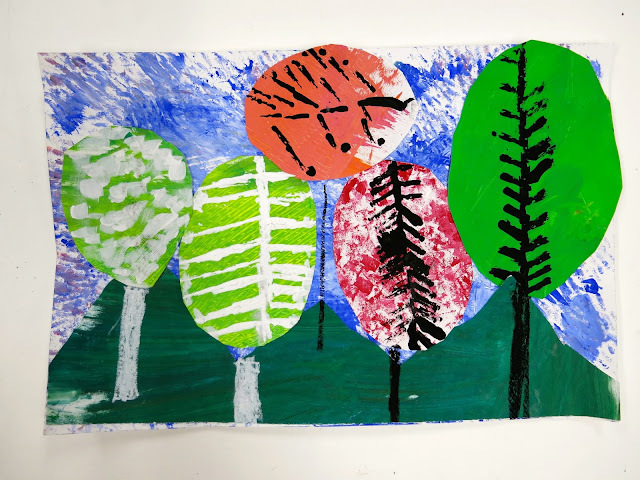 In this lesson, we learned how to mix a tint of blue, create textures in wet paint, print with a variety of tools, learn the parts of a landscape, use proper scissor use, collage and more! The kiddos were sad to place these on the drying racks as they were so excited to take them home. Not until a display in the halls for all to see, says me! 1. I start with giving one grade level (I see two first grade classes back to back in 30 minutes, no break between) one color and white. I focus on the words TEXTURE and TINT. I tell the kiddos that they are to apply the color to their paper in large plops. Then they clean their brush on their messy mat by sweeping it back and fourth. 2. White plops are then added and mixed with the color. Viola! Now you have a tint! Let's create a texture. 3. 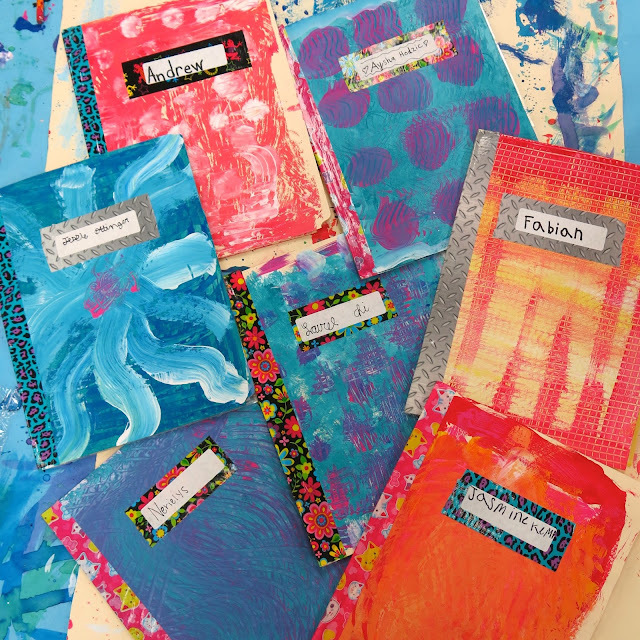 Using a variety of scrub brushes, dusters, paint scrapers and more (most found at the Dollar Tree), the kids then add texture to their tinted papers. Once finished, they place it on the drying rack and grab another sheet to more more papers. No names need to be written on the papers as they are going in a communal stack to be used later. 4. The following glasses are given a different color and white...this makes it so we end up with a rainbow of papers! From there, we printed! 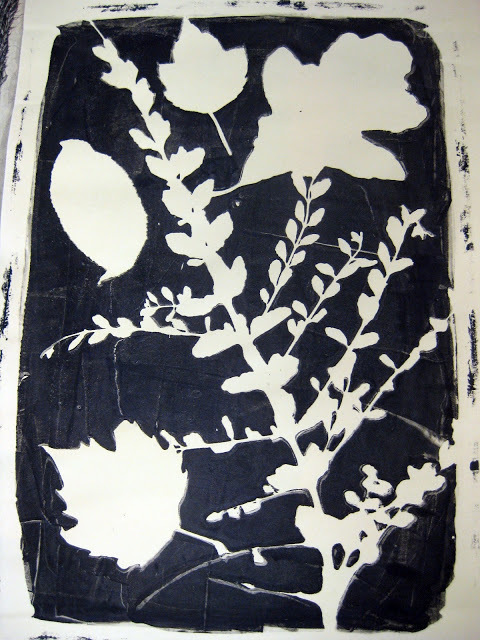 One day we printed with white paint and the next, black paint. Week Two: After another day of printing, we had a nice stack of painted trees. Those we kept for our own, we did not share. 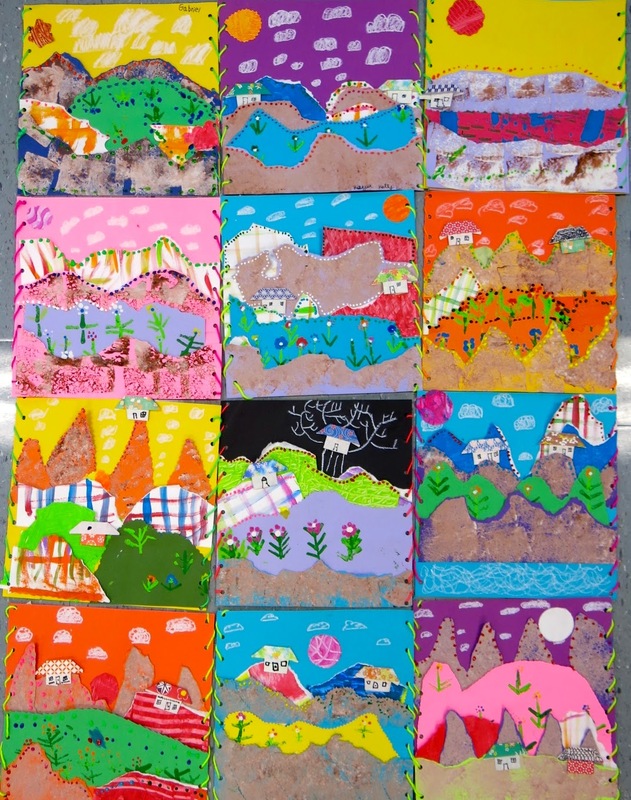 We learned all about landscapes, horizon likes and collage the following day. 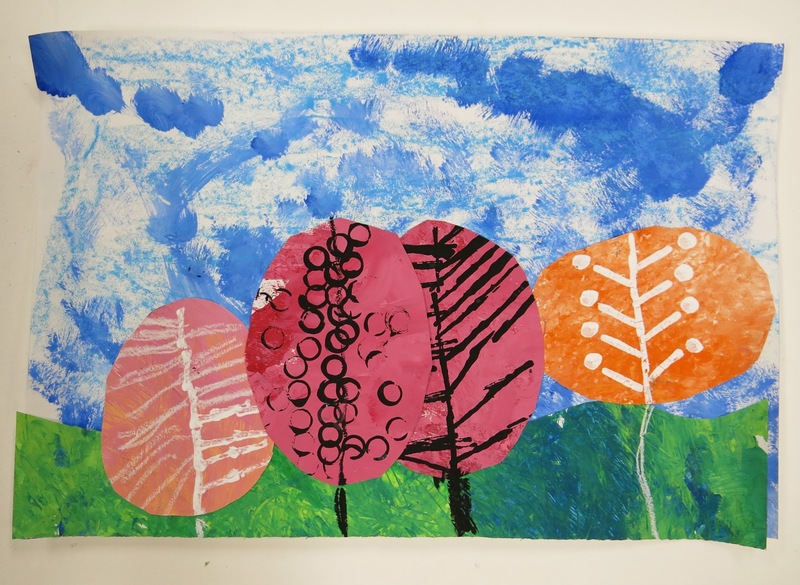 We then cut a piece of land and added it to our chosen sky background. 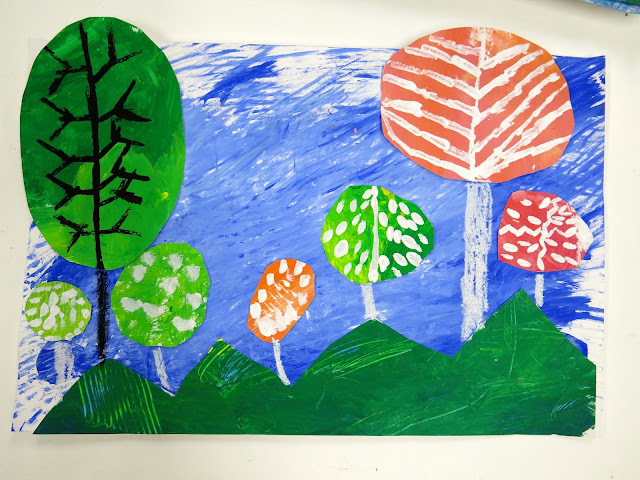 Week Three: We talked a lot about overlapping, variety and composition the final day before we glued our trees down. I did alter the lesson in that, after the kids glued the trees down, I had them use black and white oil pastels to add the trunks, not paint. Less mess on our last day. I've not matted and framed them for the halls yet, hence the curled edges. I'm looking forward to popping all of our landscape projects up in the halls very soon. Now that these guys are finished, we can move on to our next big undertaking. Just don't ask me what that is yet! I'm just gonna sit back and admire the view. I was so excited with how these turned out (and now excited the kids were) that I immediately popped them up onto my IG page. 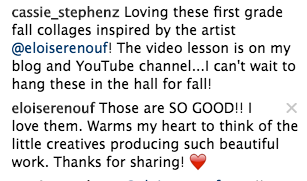 Imagine how excited I was when our artist inspiration, Eloise Renouf, posted below...it seriously made my day! I cannot wait to share her message with the kiddos! 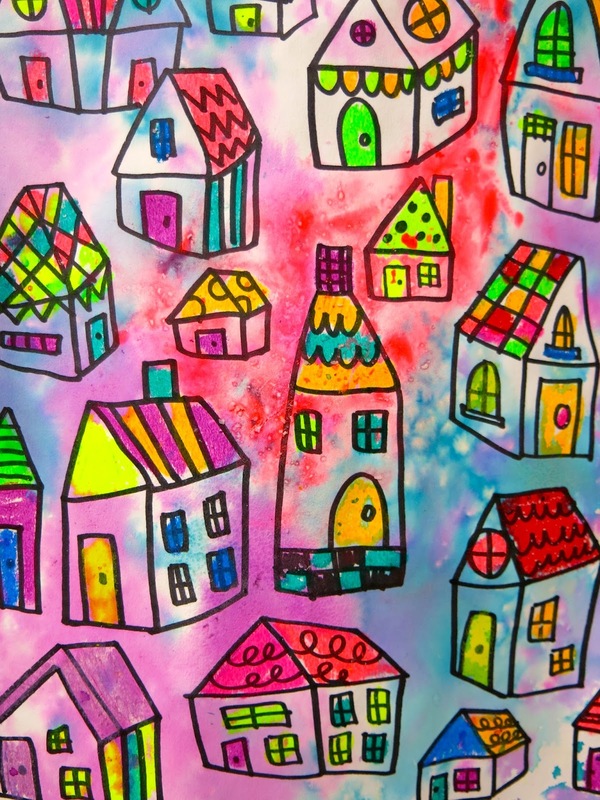 In the Art Room: A Colorful Village! What's the worst thing about taking time off from school? Say it with me: SUB PLANS. Well, I thought I'd share a couple of sub plannin' tips with y'all today along with my most recent sub plan video! Let's kick it off with that, shall we? My super fabulous sub will be hanging out with my artists for a couple of days. Most of my classes are just 30 minutes long...so, for that reason, I've left my sub this video and some instructions: just have the kiddos create the houses and begin the coloring portion. I learned my lesson the hard way my very first year teaching: don't leave a sub anything complicated. Granted, my first year teaching, all I left out were markers (brand new ones, mind you) only to find them scattered about with their caps off when I returned. Needless to say, I'll be handling the painting side of this project when I return. Speaking of, here's why I like having ALL of my grade levels work on the same project AND have them continue to create when I return. It means that, come Monday, I'm not running around, scratching my head wondering what we are working on. Instead, I can take it easy, set out one supply: watercolor, and know that it will be a calm way to return. Not only that, but we'll have a beautiful masterpiece to show for our efforts even if the art teacher had the day off. Before we continue chatting about this project, I thought I'd share some of my other fave sub plans that resulted in beautiful creations. Feel free to use these sub plans in your art room! I have to say, whenever I can, I call upon the same subs. My subs LOVE these videos...at least that's what they tell me. 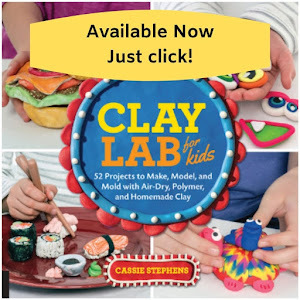 It makes their life so much easier and the kids are actually creating! Not just watching a video (well, they ARE but you know what I mean) or doing busy work. The kids are engaged and that makes the subbie's job so much easier. Complete version of this sub plan can be found here. This sub plan was a fun one...I could tell the kids had a blast based on the monsters they created! Find the complete details of this sub plan right here. While prepping for the sub, I created an Art Teacherin' 101 all about planning for a sub. This is what I can accomplish in an ideal situation: when I know I'm going to be away and I have plenty of time to prepare. Not all of us have this luxury. But, when I do, this is what I do. Holy Moly, this has been one of THEE most popular lessons I've shared on my blog: The Wings Mural! I've seen so many versions of this lesson and I LOVE it! This all started out as a sub plan and grew much bigger than I ever imagined. I'm so thrilled so many of y'all have found it useful. Here's the link to the original blog post. My very first sub videos were created when I had to be gone for...jury duty. Boy, that was a good time. Let me tell you, nothing makes you happier for your chosen profession than...JURY.DUTY. Anyway! My sweet artists created these happy hearts while I was away jurying. Alrightie, now let's return to the sub lesson at hand, shall we? As I was sayin', with my sweet sub, my artists will be learning how to draw a 3-D house. I'm encouraging them, via video, to create a variety of houses embellished with patterns. 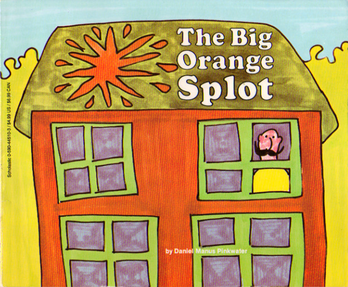 As inspo, I'll be leaving my sub the book The Big Orange Splot to read to the kids if time allows. If this book is not in your library, it totally should be. AND, if it is, can we PLEASE talk about what Mr. Plumbean is serving over at his house during those late night talks with the neighbors? 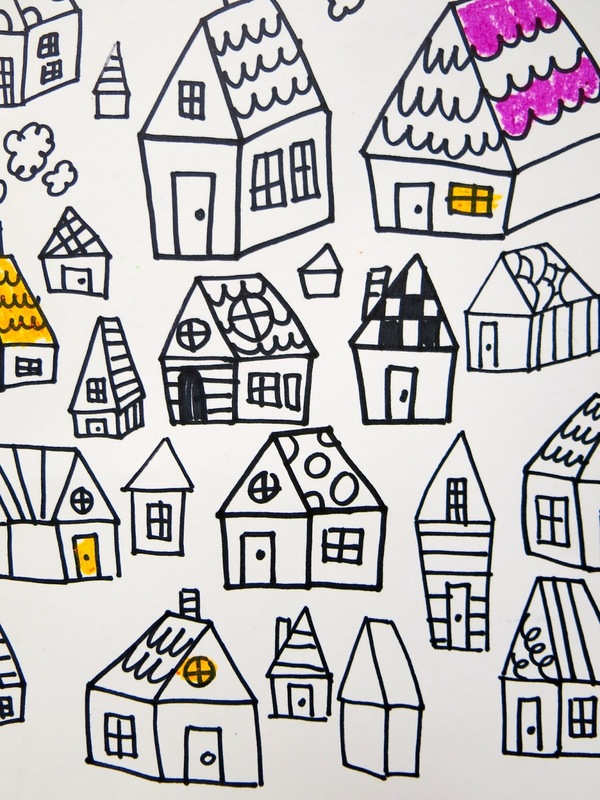 I'm thinkin' it's pretty good stuff to inspire those wild houses created! AND now let's talk oil pastels. THESE ARE MY FAVORITE ON THE PLANET! I keep referring to them as Galaxy in my IG feed because I'm completely ignorant. Sorry, my bad. They are GALLERY (I get points for staring with the same letter, don't I?!) and they are by Sargent. 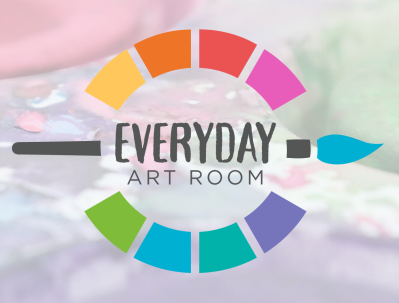 They are also sent from Art Teacherin' Heaven and I cannot recommend them enough. 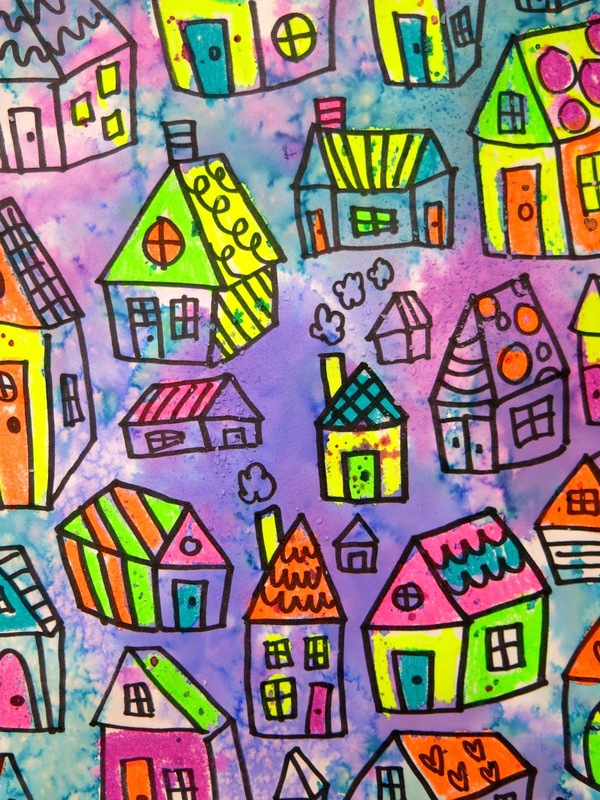 When I return, the kiddos will add a splash of liquid water color paints and return to their usually scheduled program. I'll be happy they continued to learn and create in my absence and they'll be thrilled not to have watched a mindless vid and drawn all over a worksheet. Winner-winner, Chicken Dinner! LOVE to hear your fave sub plans! AND, if you give this project a-go, I'd love to see the results. Be sure and tag me on Instagram, Facebook or where ever you get your social media on. In the Art Room: Roy G. Biv Decor!